There are any number of ways to approach the planning, implementation and evaluation of ongoing eco-efficiency initiatives and sustainability in your business in an integrated way that delivers the results you seek. Research shows that the effort that goes into small stand alone projects may be wasted if your business does not have: leadership with an overarching vision; an approach which engages internal and external stakeholders in a meaningful way throughout the process; accountability systems that are embedded into the organisation; and relevant, manageable data (and key performance indicators) which can be used in the cycle of plan, do, check, act. After all, you can’t manage, what you don’t measure! This may appear to be a huge task. Here are just some of the quality tools available to help organisations along the way. Many include case studies and practical examples. Here are a just a few of some of the resources already available for those getting started on sustainability (depending on the context of your organisation’s work). 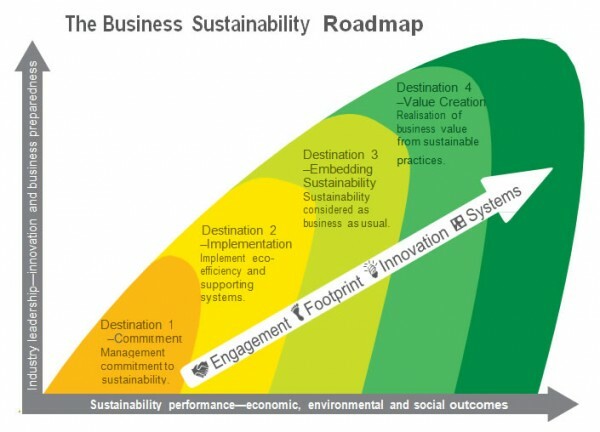 Here’s a 19 page step-by-step guide for business sustainability from the International Institute for Sustainable Development. Ecobiz webinars (funded by the Queensland Government and delivered by the Chamber of Commerce and Industry Queensland (CCIQ) with assistance from the University of Southern Queensland. Here’s a 2011 report from Victoria’s Sustainability Commissioner, about developing your organisational structure towards supporting business sustainability. Systems, KPIs, communication and integration with the corporate plan are key. There are many frameworks available such as the Natural Step, the Global Reporting Initiative (GRI), and so on. Whatever approach you choose, it’s important to focus on ‘material’ issues which matter most to your stakeholders and use appropriate metrics/evaluation systems to keep informing your planning cycles as you move forward. This presentation looks at that journey forward through the various stages of maturity in sustainability strategy, and looks at how the balanced scorecard can help monitor and drive progress. Three free short online films about sustainability are featured elsewhere on this website at the ‘What is Sustainability’ page. Purchase Australian-made introductory videos on sustainability for businesses and schools (including screening license) from VEA in Victoria. The New South Wales Chamber of Commerce has put together an easy to follow 50 page toolkit for business sustainability around the office available here. 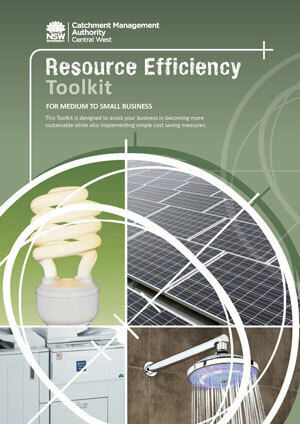 A Resource Efficiency Toolkit for small to medium enterprises to save energy, water and waste has been developed by the Central West Catchment Management Authority in partnership with the Bathurst – Orange – Dubbo Sustainability. Here’s a ‘how to’ guide to getting started on sustainability. It was authored by Christopher Hodge and published by the International Facilities Management Association in 2009. For business, here are 8 questions to help you get organised as you work towards sustainbility from GreenBiz. The Natural Step is well known around the world and has developed a series of free downloadable toolkits here. Bob Willard is a sustainability author and speaker who is happy to share his slide presentations on his website here. He has also provided a series of 8 podcast interviews on various topics which can be found on the New South Wales Government website called It’s a Living Thing. The UK’s 2degrees organisation has developed ‘Sustainability Essentials: Building Energy Efficiency Through Behavior Change’ collaboration with Cushman & Wakefield. It’s a free no-nonsense guide for both beginners and experienced professionals. It includes a comprehensive overview of how behavior change can translate into real energy savings, with practical tips on how to engage occupants and a guide to further reading. Listen to the webinar that accompanies this guide for answers to some common questions about implementing behavior change. More resources can be found via Ceres, a non profit organisation based in the USA which mobilises a powerful network of investors, companies and public interest groups to accelerate and expand the adoption of sustainable business practices and solutions to build a healthy global economy. Ceres was set up six months after the 1989, Exxon Valdez oil spill disaster. Ceres established the Global Reporting Initiative for sustainability reporting and it leads the Investor Network on Climate Risk. Its achievements and history are outlined here. The Carbon Market Institute, ClimateWorks Australia, Seed Advisory, Climate Mundial and Baker & McKenzie will launch their Carbon Decision Making and Risk Management: A Guide for Business in March 2013. The Guide is designed to cut a clear path through what can seem a daunting and confusing area of carbon pricing legislation. It provides businesses impacted by the Carbon Pricing Mechanism (CPM) with a ‘decision-tree’ type framework and software tool. The Guide aims to identify and analyse key carbon cost risk exposures under the CPM and determine the most appropriate strategies to manage your carbon liability. There are a great many books on business sustainability (see also Background Reading). Here are a selection of four, each with a different focus. One of the most practical and comprehensive among them is ‘The Sustainability Handbook’ by William R. Blackburn, published by Earthscan-Routledge in 2007. The book is adaptable to most organisations from businesses to schools and non-government organisations. The book includes many templates, planning tools, stakeholder engagement approaches, case studies and options for measuring success. Another practical but shorter guide is ‘The Green Executive: Corporate Leadership in a Low Carbon Economy’ by Gareth Kane and published by Earthscan-Routledge in 2011. The book’s structure includes four parts: Why do it? ; The Global Context; Practical Action; and Making it Happen. There are 18 interviews with senior-level executives from a range of sectors is presented as ‘A View from the Frontline’. ‘The Green Scorecard: Measuring the Return on Investment in Sustainability Initiatives’ is written by Patricia Pulliam Phillips and Jack J. Phillips (published 2011 by the ROI Institute). This easy to carry paperback focuses on their patented methodology and metrics for measuring the success of sustainability projects. The book makes the maths easy and shows how to build a case for sustainability projects in a way that anticipates the potential pitfalls. The book goes well beyond quantiative methods and takes a triple bottom line approach that can be tailored to any organisation, big or small. ‘True Green @ Work: 100 ways you can make the environment your business’ is a short, very visual, Australian book written by Kim McKay and Jenny Bonnin (ABC Books, 2007). Unfortunately it may be out of print and is being heavily discounted in shops. Proceeds from the book went to Clean Up Australia and the National Business Leaders Forum on Sustainability. Kim McKay in Sydney has won a prize from the US AAAS for her children’s book on ’100 things you can do to save the planet’. Check out the Background Reading and Communication and Behaviour pages of this website and other individual topic pages (all works in progress).